I never miss an opportunity to eat at Da Cesare, especially when my local tasting group assembles in what has become an almost ritual pilgrimage to this temple of everything that is satisfying to the soul about Piedmont. The early April weather was quite chilly and rainy, more reminiscent of Fall than Spring, except for the absence of truffles. Nevertheless, it was the perfect night to enjoy a selection of wonderful Barolos and Barbarescos. Although a choice is offered for the pasta course, the rest of the menu is fairly set at Cesare these days so diners don’t need to make any difficult decisions. It was another terrific evening of great food, wine and company at Da Cesare. Insalata russa is one of the classic Piedmont comfort foods. The ingredients are simple- diced peas, potatoes, carrots, mayonnaise and chopped egg- yet in the hands of the inspired Cesare the dish was sublime. Giacomo Conterno’s 2001 Barbera d’Alba showed very well, with plenty of sweet fruit and full-bodied, powerful texture. It appeared to be in an adolescent stage, its tertiary notes just starting to develop. The 1998 Giacomo Conterno Barolo Cascina Francia has developed beautifully since I last tasted it about a year ago. This bottle was especially open. It presented sweet, floral notes and a layered quality to the fruit, with fine tannins on the long finish, giving the impression of being a more slender Cascina Francia than is normally the case. Cesare’s grilled scampi were phenomenal. Cooked to perfection, they were delicious on their own and didn’t need the accompanying tomato sauce. The next dish was classic Cesare- a rich parmesan cream with asparagus and a poached egg. Giuseppe Mascarello’s 1979 Barolo Vigna Rionda was a treat to enjoy. It was a big, strapping old-style Barolo packed with classic Serralunga notes of iron, leather and licorice, all wrapped around a tight core of backward dark fruit. I was amazed at the wine’s dark color and its overall freshness, all of which conveyed an impression of power and youthfulness. The story behind Mascarello’s 1979 Vigna Rionda remains one of the great pieces of Piedmont lore. In 1979 an importer asked Mauro Mascarello to make a Serralunga Barolo. After looking for a suitable source of fruit without success, a broker took Mascarello to the home of Canale, a grower who owned a parcel in Vigna Rionda, one of Barolo’s top sites. When they arrived the broker and Mascarello discovered that Bruno Giacosa was already inside negotiating for the grapes. As it turned out the asking price was too high and Giacosa ended up passing. Mascarello also thought the price was exorbitant, but the grapes were extraordinarily beautiful, so he bought them. When Mascarello vinified the fruit he was alarmed at the lack of color in his wine. Canale reassured him that color would come in time, but the wine remained pale into the next harvest so Mascarello passed on the opportunity to buy the fruit in 1980. As fate would have it, the one and only vintage of Mascarello’s Vigna Rionda turned out beautifully and Giacosa’s wines from this source ended up being among his most profound Barolos. Gaja’s 1958 Barbaresco “Infernot” is another of Piedmont’s historically significant wines. It was produced from the Secondine vineyard, which today is planted with the Cabernet Sauvignon that is the source of Gaja’s Darmagi. In Piedmontese dialect infernot refers to the niches where bottles were traditionally kept in old-fashioned cellars. In the 1950s it was common for estates to bottle their wines only as they were ordered. Gaja’s “Infernot” was the last of the estate’s 1958 Barbaresco to be bottled. Initially somewhat closed, it improved dramatically throughout the course of the evening. Though fully mature it showed pretty, delicate layers of ethereal fruit on a medium-bodied frame of notable length. The finish seemed to last forever and we were all captivated by its seductiveness. It was still fresh and expressive when tasted the next day. Today the tradition of making multi-commune Barolo is virtually non-existent, but every time I taste one of Giuseppe Mascarello’s wines from the 1960s I am left utterly speechless. The 1964 Barolo was made from a blend of Monprivato, Villero and Bussia Soprana. Medium in weight, it was sublime in its expression of sweet, perfumed fruit, showing profound elegance and stunning balance, with the sinewy tannins that are typical of the wines of this era. It was an unforgettable bottle. If the Mascarello showed the more feminine side of Barolo, Giacomo Conterno’s 1945 Barolo was the exact opposite. Made by Roberto Conterno’s grandfather Giacomo, it was fascinating to taste this Barolo given its historical context. I was amazed at the wine’s deep, dark color. It presented expressive notes of smoke, tar, earthiness, spices, plums and prunes on a large-scaled frame of extraordinary power. Multi-faceted and complex, it revealed different sides of its personality with each taste, and was still a profound wine when I tasted it the next day. At 62 years of age, I think it is safe to say that the firm, somewhat dusty tannins will always remain a part of this wine’s DNA. Needless to say it was a privilege to drink Conterno’s 1945 Barolo from a perfectly stored bottle. With wines like these it would be easy for the food to suffer by comparison. Not at Cesare. The spit-roasted rabbit was seasoned and cooked in the style of Cesare’s signature capretto (baby goat) which we opted to skip for a chance of pace. Succulent, tender and delicious, it was a great match to the profound wines on the table. I didn’t have room to try everything on the dessert sampler, but I couldn’t leave without tasting Cesare’s zabaglione al moscato, which was, as always, prepared to order and generously served on a poached pair. 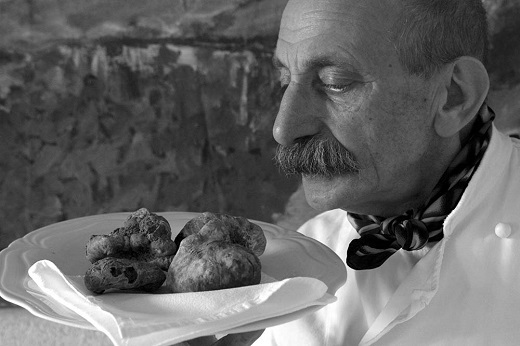 This extraordinary meal had me looking forward to the Fall, when truffles once again grace the dishes of the inimitable Cesare Giaccone.